A Japanese restaurant chain has paid over three million dollar (333.6 million yen), in a record New Year auction at Tokyo's new fish market. “The tuna looks so tasty and very fresh, but I think I did too much,” Kiyoshi Kimura, the owner of the Sushizanmai restaurant chain, told reporters on Saturday after the auction. The price Kimura paid for the 278 kilograms (613 pounds) bluefin tuna caught off the coast of Japan's Aomori prefecture is double the price he had paid six years ago. In 2013, he set a record for buying a tuna at 1.7 million dollar. 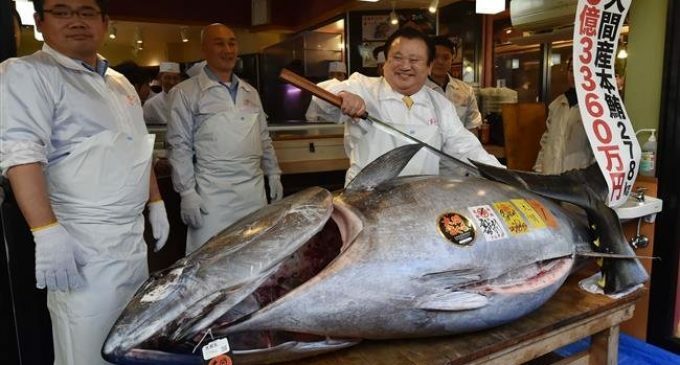 Shortly after the auction, the record breaking tuna was transported to one of the sushi chain's outlets located in Tsukiji, the old fish market. Saturday's auction was the first New Year bid of the new Toyosu market, after the iconic Tsukiji fish market was closed to make way to provide temporary parking for the Tokyo 2020 Summer Olympics.